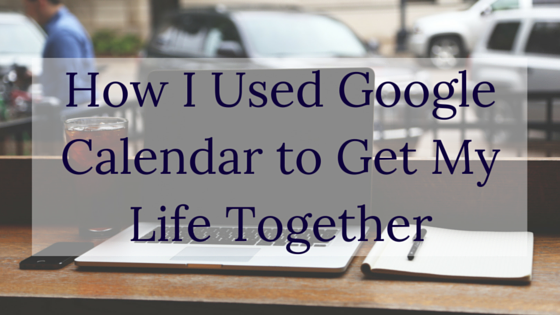 When I was planning out my blog posts, this one was originally called “How Google Calendar Helped Me Get My S#!^ Together.” I’ve wanted to be able to use Google Calendar efficiently for forever. I have tried in the past, but it didn’t make sense to use it for school because my access to a computer was limited. This summer, however, I needed a way to be able to plan out all my blog posts because I was getting behind, and I had to have a way to keep track of my ideas. 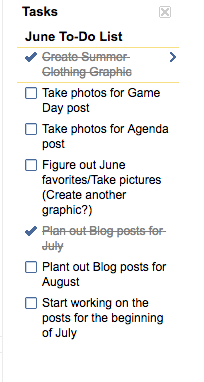 I have tried having a blog agenda, but I end up not using it, and it all goes to waste. I figured if I could sit down for one day that I could find a way to use Google Calendar that was efficient and made sense to me. 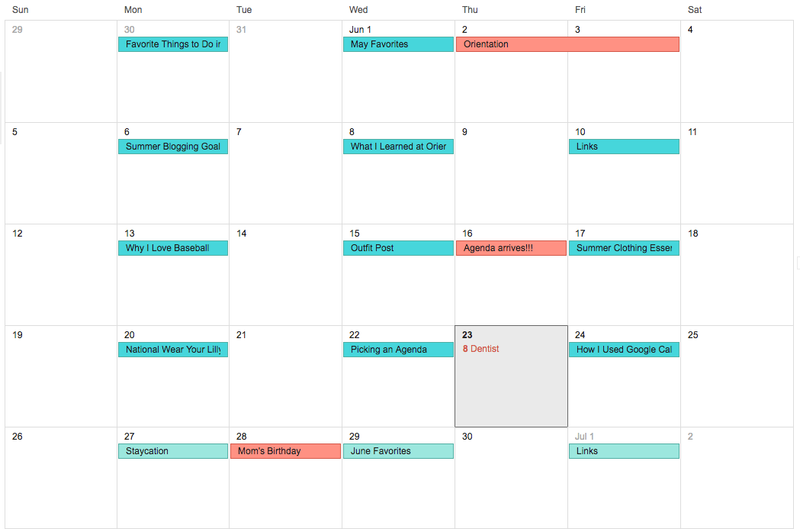 Low and behold, I was able to plan out June, July, and August blog posts and organize my first month of college activities. 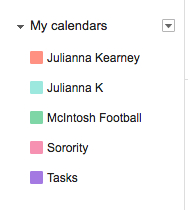 Google Calendar was finally working for me, and I think it will continue to help me out in the fall because I will have access to a computer more often than not. I love Google Calendar because it's on both my computer and my phone, so I have it with me 99.99% of the time, and I can easily move things around with having to scratch out or erase my notes. Most the time I prefer pen and paper, but I am absolutely loving Google Calendar to help me with planning out my blog posts. Tip #1: Create different calendars with different colors | I have four different calendars: a main one that is red which has all my doctor’s appointments, school activities, and miscellaneous stuff, a blog one that is blue which is my posting schedule, a sorority one that is pink which has the recruitment schedule and will have all my events once I get those, and a high school football one that is green which is mainly so I can figure out when I should come home to visit. Having the all the separate calendars and colors allows me to view just one of them or all them to see how crazy busy I am. When I am focusing on blogging, I only have my blog calendar visible to see what days don’t have posts and the order of everything and what I have to accomplish. When I am trying to determine if I have time to get something done, I look at all my calendars. 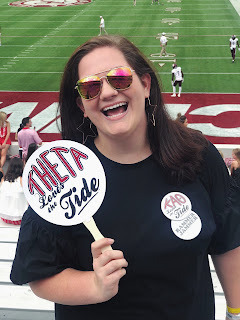 Tip #2: Change the color of something when it’s done | I really only use this for blog posts, but I am trying to get a ton of stuff done in advance, so when I move-in and I start school I am not behind. I’ve been pre-writing a ton, so when I am all done and the post is scheduled, I click on the event and change the color to a darker blue. This helps me again to know what needs to be completed and what is already done. Like in June, I shot four outfit posts in one day, but they weren’t all going up in June. Two of them were going up in July, but since the photos were already taken, I went ahead and wrote the post. I changed the color of the event so I wouldn’t worry about those specific posts anymore. Tip #3: Utilize the tasks feature | The tasks feature helps me a ton with blogging. I create a to-do list for each month, and when I am viewing that month, I write done everything that has to be done for the month of blogging excluding writing the posts, which is pretty obvious. I write down how many outfit posts I have planned, what photos I need to take for other posts, and how many graphics I need to create. Then whenever I switch to look at a different month, I switch which to-do list is on the screen. Tip #4: Always keep Google Calendar open | When I open up Google Chrome, three tabs open – a new tab with Momentum (because I like the quotes), Google Calendar, and Blogger. Since it’s summer, I have been spending a ton of time on my computer working on things, so I always keep my calendar open. Whenever I get an idea or something comes up, I can easily switch tabs and add it to my calendar that way I am very rarely having to remember something. Google Calendar is also what comes up when you hit the home button.